In his address to the nation on his birthday, King Bhumibol Adulyadej of Thailand has urged people to support each other for the sake of the country. Thailand is marking the 86th birthday of King Bhumibol Adulyadej amid a truce after days of violent protests in Bangkok. Speaking at his palace in the coastal resort of Hua Hin, King Bhumibol Adulyadej said that Thailand had been peaceful because of the unity of the people. The demonstrators, who are demanding that the current government resign, began protesting on November 24. On Thursday, thousands of people had headed to the town of Hua Hin, near the king’s Klai Kangwon palace, in the hope of seeing him, the Bangkok Post reports. Special bus and train services had been laid on by the transport ministry to bring people to the town, the paper says. 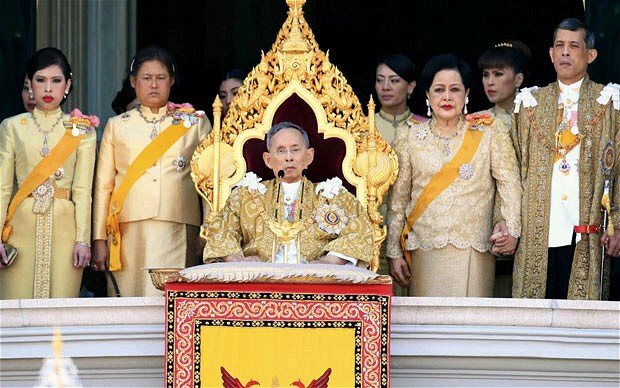 The kings traditionally deliver a speech to the nation on his birthday – an audience keenly anticipated for any hints of his thinking on events in Thailand. He called on people to do their duty to support each other for the sake of the country. “All Thais should realize this point a lot and behave and perform our duties accordingly, our duty for the sake of the public, for stability, security for our nation of Thailand,” the king said. The current wave of protests began in Bangkok relatively peacefully, but things took a violent turn over the weekend and on Monday. Protesters tried to topple police barricades and storm the prime minister’s office, Government House. Clashes broke as police used tear gas and water cannon to repel them. The situation calmed down on Tuesday after security forces stepped back from protesters. Some anti-government protesters headed to the police headquarters in Bangkok on Wednesday. A few hundred of the protesters were allowed inside the compound by the police and then withdrew. The protesters say there is more to come. “After the king’s birthday, we will start fighting again until we achieve our goal,” former deputy prime minister and protest leader Suthep Thaugsuban told AFP on Tuesday. The protesters want the current government under PM Yingluck Shinawatra to step down and be replaced by an unelected “People’s Council”.